How do they do those wonderful moving camera shots in stop motion animation, and furthermore where do they get the wonderful toys used to do so? Motion Control rigs, are a must have in today’s stop motion animation world to create those beautiful moving camera shots. Imagine, if you will, the dexterity of mind needed to keep track of a camera that needs re-positioning 25 times during a seconds worth of shooting. At the same time you’ll be moving your screen subjects, which maybe 1 puppet or in the current case of Animation supervisor Jody Meredith, it’s 32 puppets, the required amount of distance 25 times for that seconds worth of film, to make a smooth and believable animation. This seems hard enough, right? Now imagine, that 3 or 4 of those 25 frames aren’t working and they need to be re-shot. Proper nightmare, infact almost impossible one could argue – that’s why Motion Control (MoCo) rigs are part of the dream set-up for an animator. 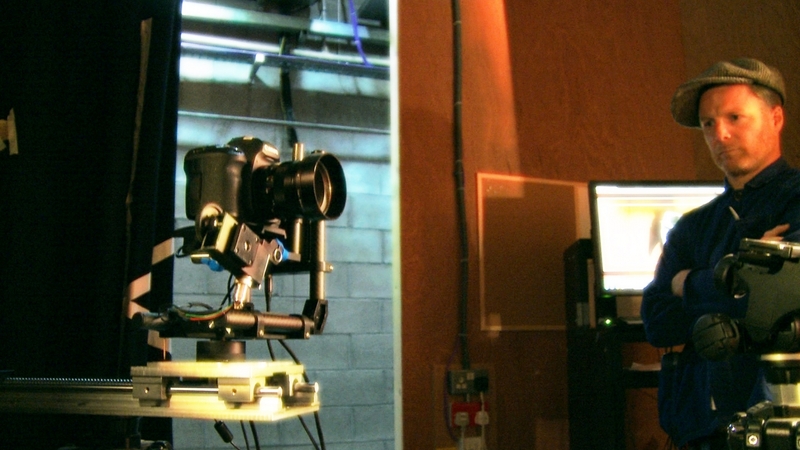 The stop motion animators, with the help of some computer software, are able to pre-program the motion control rig to move a set distance and stop at set intervals at the press of a button – which in turn, enables the animator to be able to reset the camera motion control rig to any of those pre-defined intervals and re-shoot any of the frames that aren’t working. This means the animator doesn’t have to worry about the camera at all during the animation process and instead their full concentration can be on the puppets, and the set they’re manipulating. Re-setting the scene itself for a re-shoot of a certain frame, is another story altogether, and one I’m sure we’ll tell down the line somewhere, but for now we’re just thankful for tools like Motion Control rigs to help us create the best stop motion animation we can.